Sometimes I like really simple game, games that you only need to spend a few minutes a day. This can be fun. My City is a very simple game that I like. What we do is we start with a city with no population at all, then we start to add citizens to it day by day, until you get a big city. Sounds boring, huh? The fun is you can add different kind of citizen to it, depending on what is your city's current attribute. There are 7 attributes to a city: prosperity, safety, workforce, culture, science, entertainment and health. Each citizen you add, the citizen contributes to the attribute of the city. For example, if you add a hospital doctor to your city, you add +1 safey, +1 science and +1 health to your city. 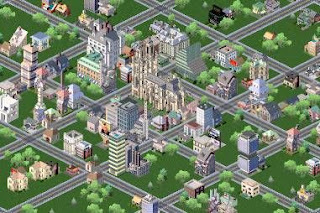 With different citizens added on and on, your city will build up with certain attribute and therefore develop into a certain style. You may have high entertainment and culture, but with low safety and health (like mine); or you may have high prosperity and high workforce, but with low culture and science, etc. With different attributes to your city, different citizen will be available to your city, and some citizen will become unavailable. For example, serial killers come into play when your city have +10 safety and >= 10 population while hospital doctors disappear when you have > +40 health, etc. The fun of the game becomes trying to make some new kind of citizen available to you and so as to increase the demography. You can also add citizens to your friends' city. The number of citizens that you can add per day to different cities depend on your population. The high is the population, you can add citizens to more of your friends. Why Facebook games are so successful? Facebook games are growing very quickly these one or two years, from very simple games for simple social connection to very sophisticated one, with a lot of players. What is the reason for it's success? 1. Natural traffics - yes, Facebook is almost the most public website on the web. If you put a game onto Facebook, you are already potentially accessible by billions of users in the whole world. 2. Easy to promote - Facebook has its own very simple way to "Create an ad", and most importantly, it is cheap. When you create an ad through Facebook, then potentially billions of Facebook users will be able to see your ad and get interested into the game. 3. Integrated login - a game can use Facebook's login framework, i.e. a user just login into Facebook, and go to the games application, then he is already login into the game. This simple authentication process had reduce the user's reluctant to sign up a new account. He is naturally drawn into the game when he feels interested, without any concern. 4. Social network - of course! Facebook is a social network site after all. What is the biggest fun in playing browser games /Facebook games is, of course, playing with a group of friends. Sending gifts to your friends and getting gifts back from them; helping out in their game world; joining adventures together etc. are actually the biggest fun in browser games above all. 5. Word of mouth - most of the games will put a post onto the player's wall when the player is playing, or when gaining some achievement in the game. In this way, all of the people in this player's friends list will be able to see it. This had become a natural word of mouth network, and natural advertisement, that will be able to be trusted as it is found on a friend's wall. This would help the game spreads very quick. I have not been writing on this blog for some time, I really miss you all! Besides really busy with my day job and daily life, I have been playing quite a lot on FaceBook games. I have thought of opening another blog specifically on FaceBook games. After some thought, I decide to put it to this blog as well. After all, FaceBook games are browser games, right? The benefits of using FaceBook as the game platform is it contains natural traffics, and automatic free advertisement. If one of your friends is playing a game, you automatic know the game, and instinctively attracted by it, since you are sure you can play together with your friend. Then, quickly a network of players grow. It had become a daily "ritual" for FaceBook game players to send gifts to friends who are playing the same game. In this way, both you and your friends grow quickly in the game, and it is more fun to share the joy with friends. Currently, the most popular games are mostly Flash based simulation games: Happy Farm, Farmsville, Cafe World, Restaurant City, Social City, Hotel City etc. just to name a few. The fun of these games resides in receiving and sending gifts to and from friends, and visiting friends game world.